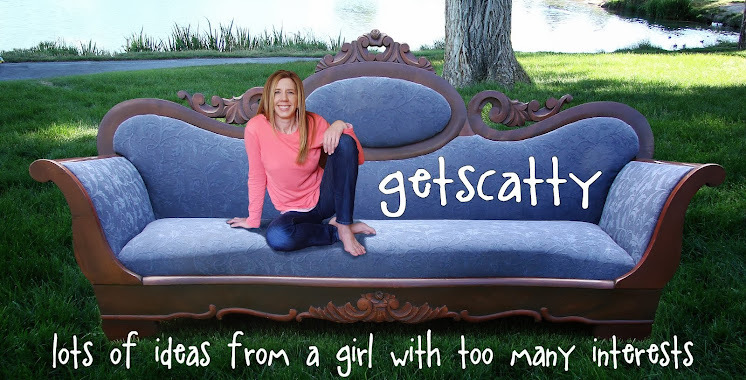 Get Scatty: Time for a change of color in the main living space! Time for a change of color in the main living space! I managed to get myself into a rut of monochromatic madness. 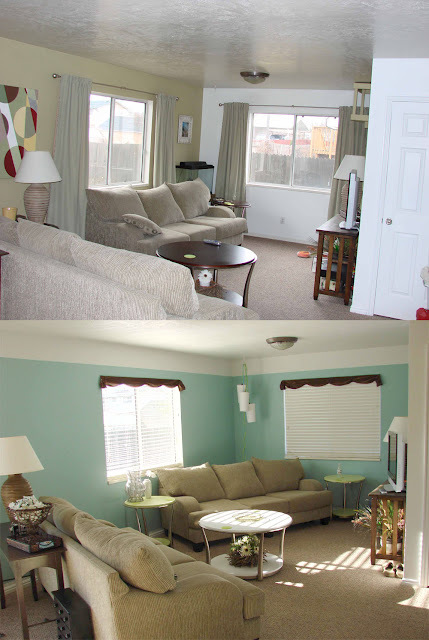 Since I do so many things as inexpensive as possible, I ended up with walls, couches, & curtains all pretty much the same color, and it wasn't looking good. This was a case of no longer being able to see what I was looking at on a daily basis... so used to it. Four years is long enough to have one color scheme. I asked Husband.... "What color should I put on the walls, cause heck I'm really rather finicky with wall color." I have always said to him... "There will never be blue walls in this house". Despite being really impressed when David Bromstad puts blue on the walls, I had already decided that blue is depressing, and so it wouldn't be in my cheerful house. HA! Guess what Husband said... "Why not take down your painting, paint a big block of blue on the wall, and if you don't like it, hang your painting back up until you have another color to try." I did have a quart of a robins egg blue from my desky thing that I got for $10 and then stained for my bedroom... That would be the color to test! So I put it on a couple walls. In this photo I have not only already decided I liked the blue, I've started painting the ceiling white, and the walls white for the first 12" next to the ceiling. I mixed up a light green paint from one called Basil, and the yellow on the wall to get that little green bookcase -it used to be red. So I had an accent color, ceiling color, and wall color decided. At the top of the photo you can see what color the ceiling use to be, rather creamy. Here's my before and after. I still as of yet don't have anything for the walls, so it's still kinda blank. I'm not a mahogany fan, and considered these too boring for their adorable shape. 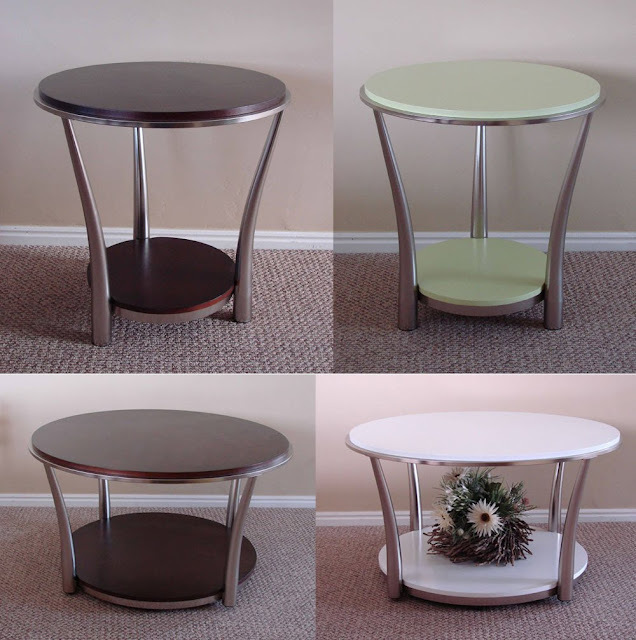 I painted the two end tables my accent green I mixed up, and painted the coffee table white. I finally had somewhere to put my neat stick planter thing I found at a yard sale. Looks cute on the white huh? This before and after is an after and after. I don't think I ever took a before photo... I bought two lamps at a yard sale with shades for $25 (back when I wasn't so stingy at yard sales) They were a charcoal color with the texture being a bit lava rock like. 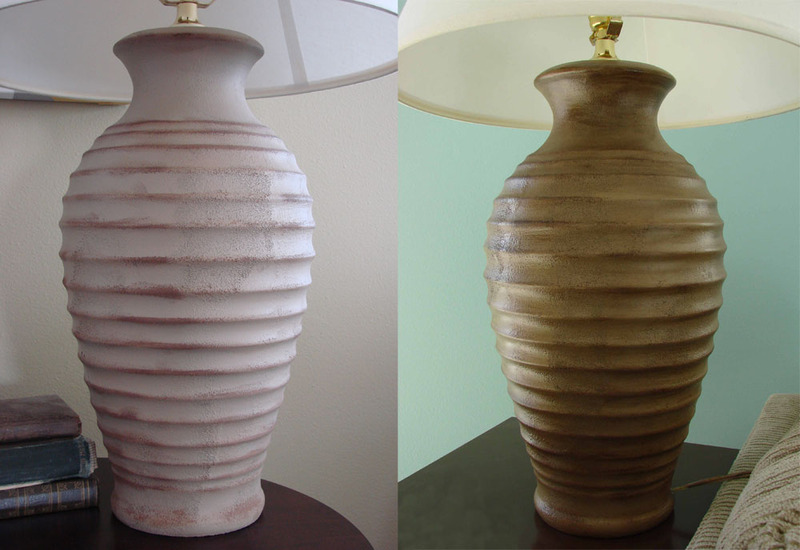 The photo on the left is what I did to the charcoal color, I spray painted it tan, then used brown chalk along the ridges to make it look warn, then I used a clear top-coat so the chalk wouldn't rub off. When I changed the room, this boring tan wasn't good enough anymore, so I just got out my favorite walnut stain (the one I use on everything) and I stained it! What a difference eh? ANDDDDD there is like a sheen to them from the stain... some things will do that with stain, it will look just a little varnished since the stain can't really soak in. 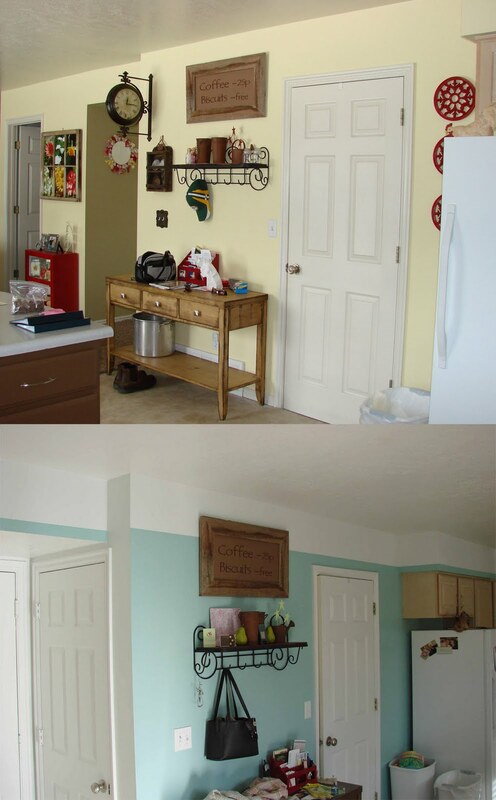 This is the same wall from different angles. 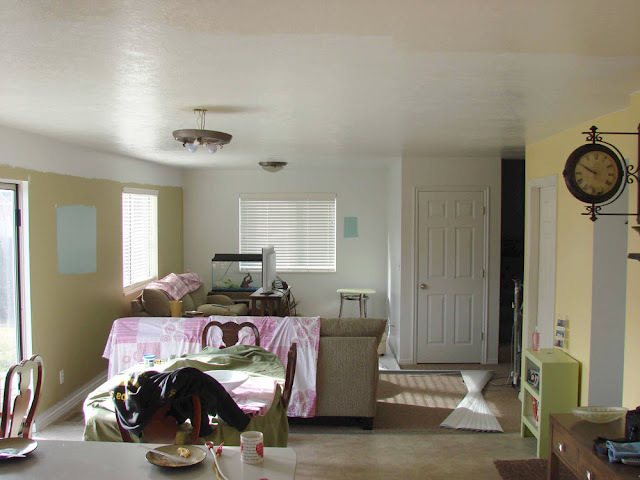 I used to have a sunny yellow and Suffolk tan on the walls. Having different walls different colors was narrowing the space even more, now that is not the case, the room actually looks wider. You can also see I carried the height of my strip onto the soffit (sp?) above my cupboards, creating a stripe at the kitchen end... I no longer hate these soffits... they look cute! I'm thinking of incorporating some pink in the area... started with a square plate on the shelf... wonder how this will work out. Don't be surprised if the next few posts are all ideas for my new blue area! Found me a pedestal table at a yard sale for $10! I need to give it a makeover for this space! I love the blue! It looks so pretty and fresh. I always love when you update. I LOVE the blue, Natalie!! Hey...I've missed you!! So glad you're back. I can see you've been busy...looks great!!!! Love the little tables too! Love a bi of colour Miss N! You ROCK! !